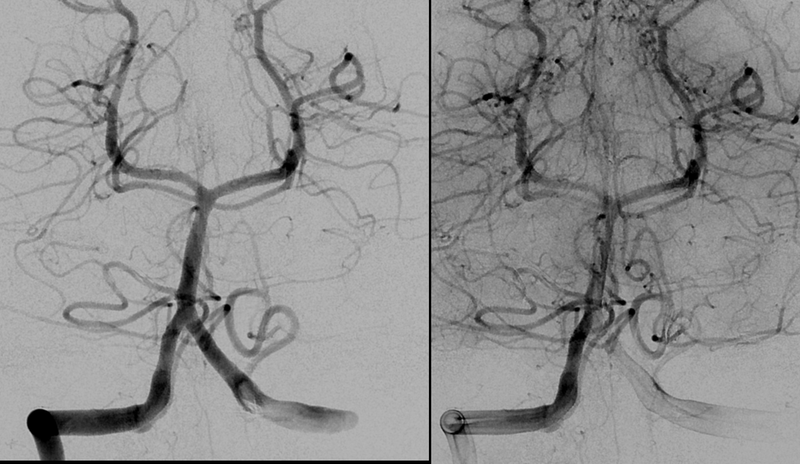 Basilar perforator aneurysms are increasingly recognized as one of important causes of “perimesencephalic hemorrhage”. 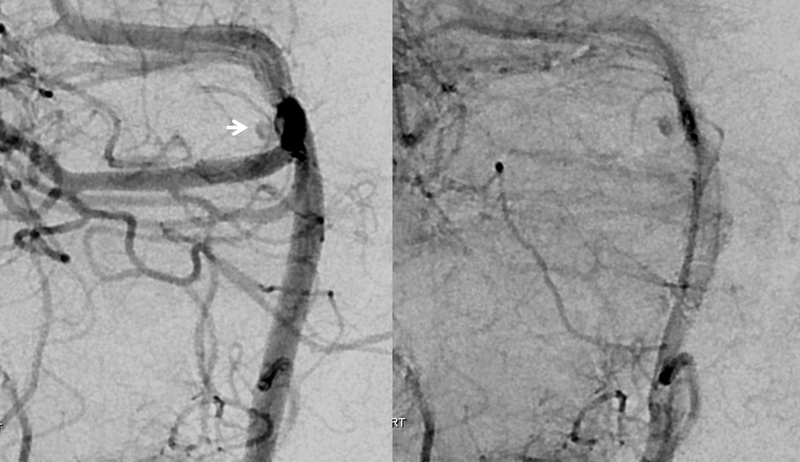 This loose, wastebasket term refers to blood in the prepontine cistern, and perhaps extending further than that, with a negative angiogram, in a patient that “looks good” or “looks perimesencephalic”. 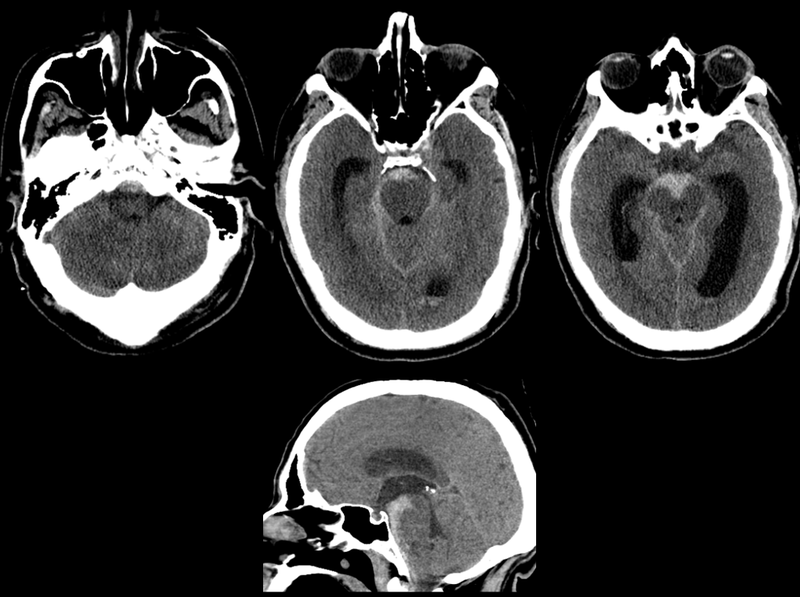 The cause of “perimesencephalic hemorrhage” is unclear, and there are uncertainties as to definition of how much blood and where exactly etc meets definition. Also uncertain is how to diagnose or manage these. 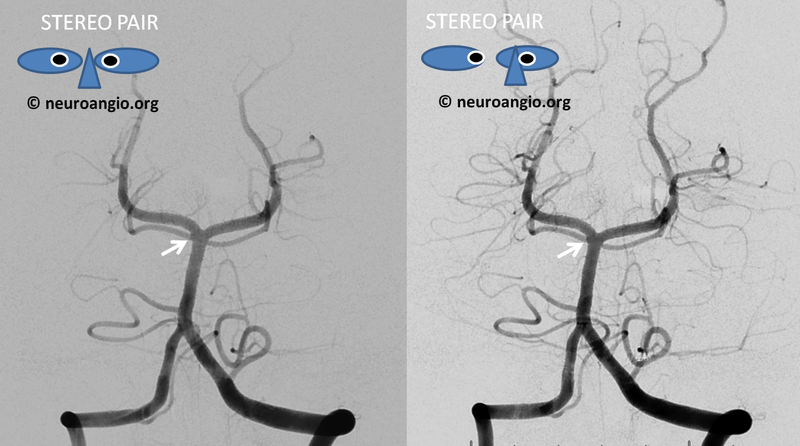 On one end of spectrum are those who advocate not even bothering with a catheter angiogram in a “typical” case. 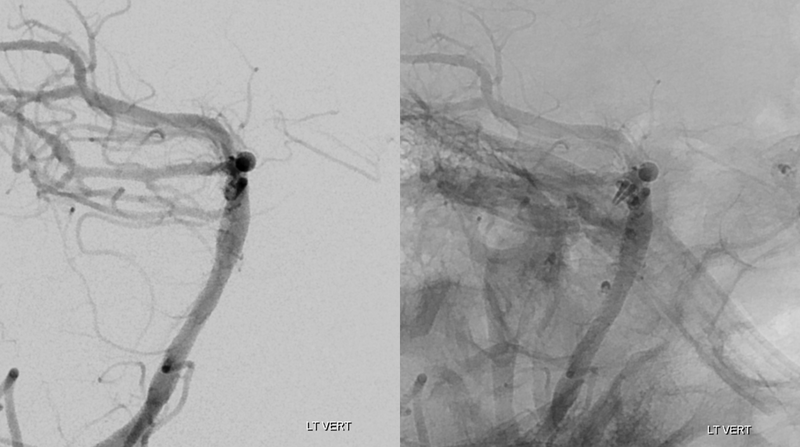 Others suggest one angiogram in early phase, and follow up with noninvasive imaging if catheter angiogram is negative. 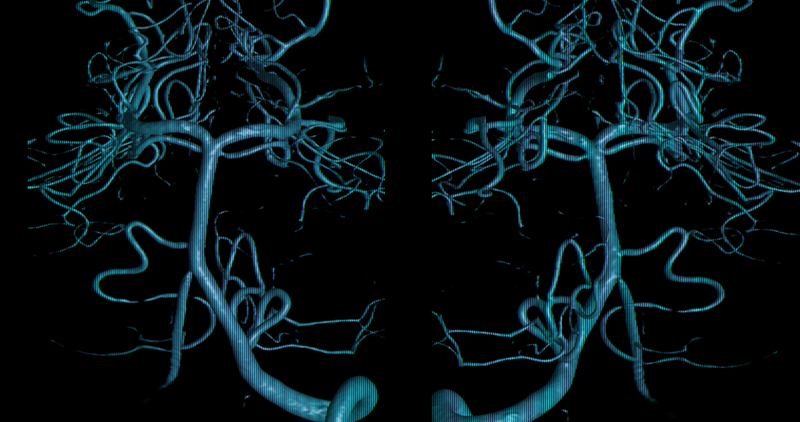 Others (ourselves included) advocate at least one delayed catheter angiogram in all cases. 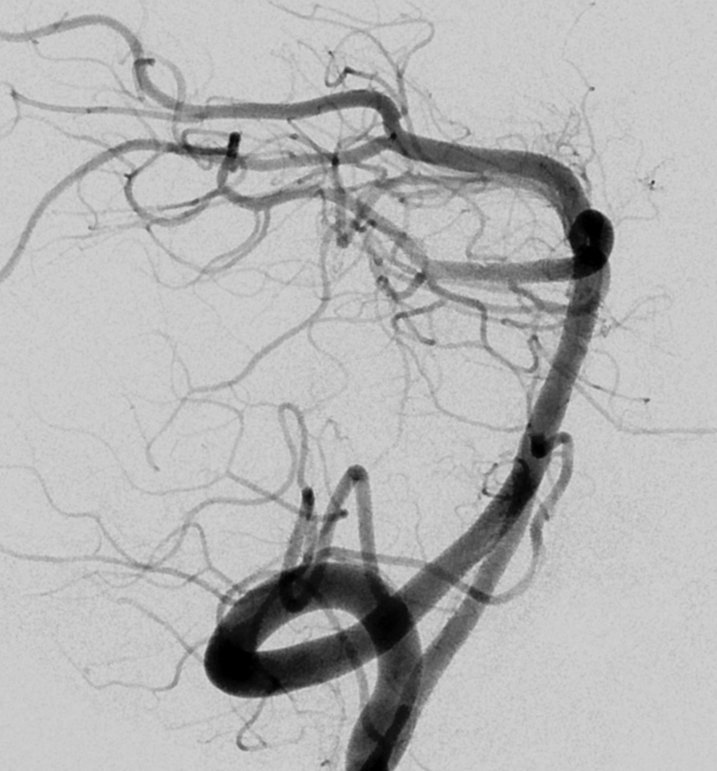 Then it gets even more tricky — should angiograms be done under general anesthesia to maximize quality of images, allow for useful rotational/3D angiography, etc. All good questions. 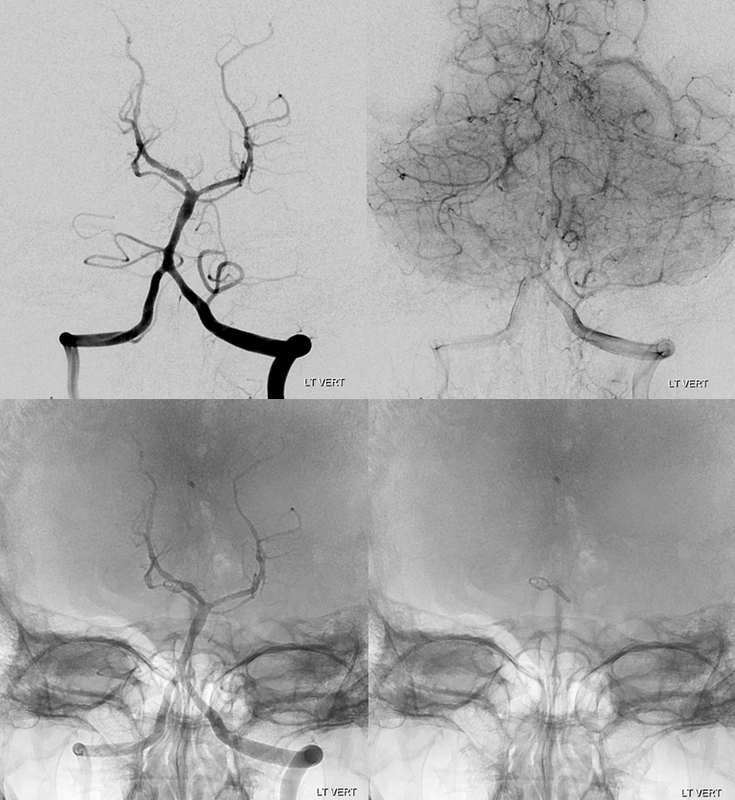 The point of this case is to highlight an increasingly recognized cause of “perimesencephalic” hemorrhage — a basilar perforator aneurysm. 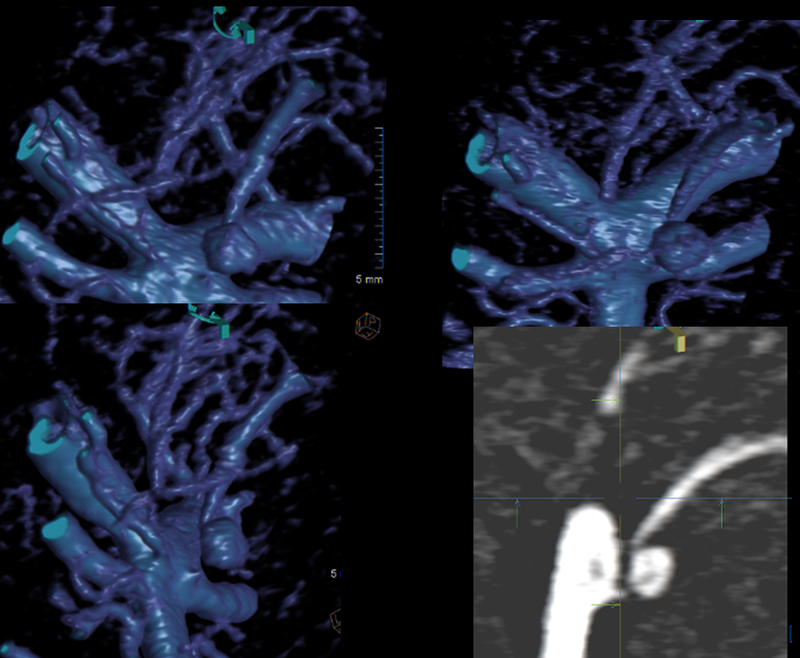 This is distinct from a basilar tip aneurysm — usually basilar perforator aneurysms arise from a sidewall perforator branch and point posterior, just like perforators do. They are being increasingly recognized in part because equipment is getting better, particularly rotational capabilities. 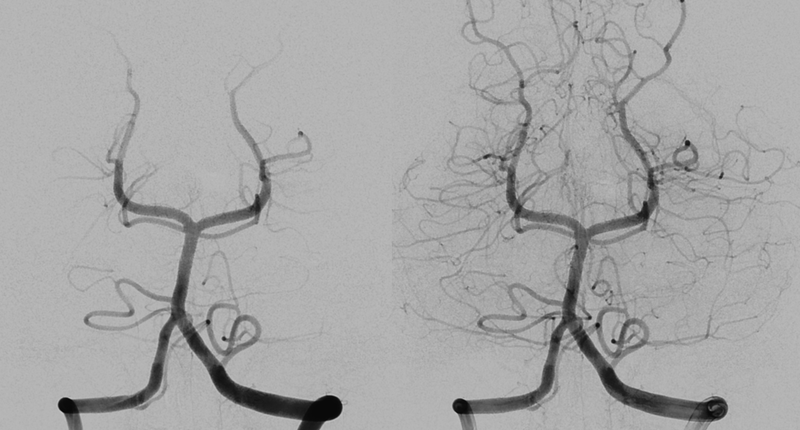 It is likely that many of these aneurysms were previously undiagnosed, and probably remain so today. Fortunately, many seem to spontaneously resolve. But not all. 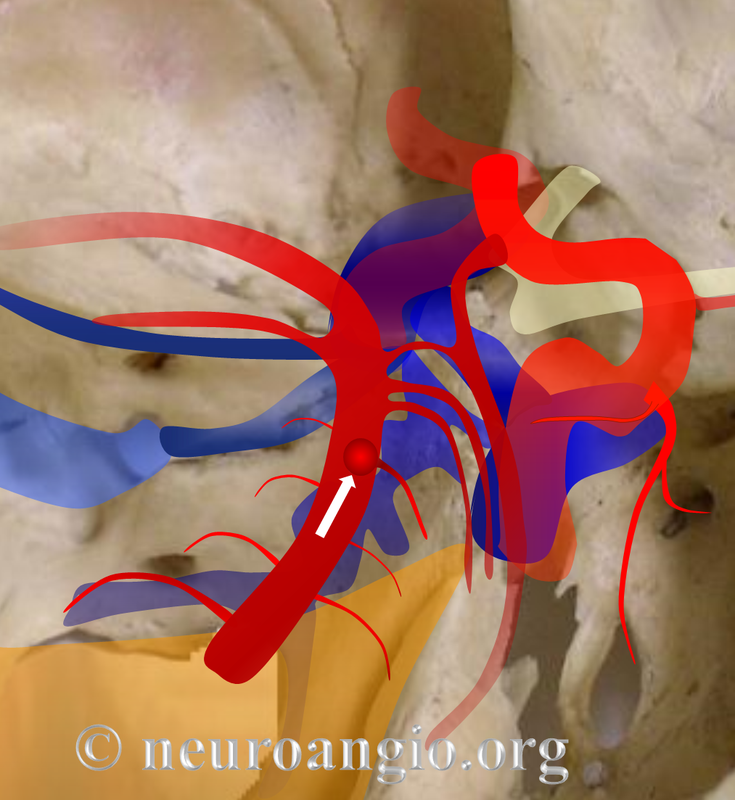 There is literature on rebleeding, bad spasm, stroke, etc. 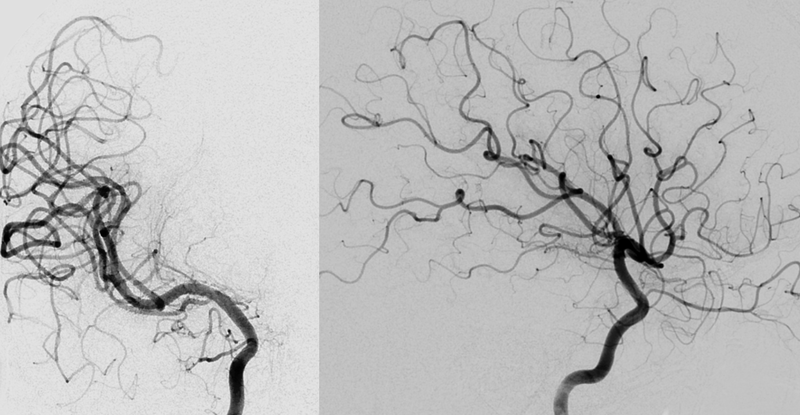 Our approach to perimesensephalic hemorrhage is initial angio under GA, and if negative a follow up angio in about 1 week, usually under GA as well. We are also particularly weary of any “atypical” perimesencehaphalics such as those with lots of blood, hydrocephalus, higher H&H grades, etc. What to do? 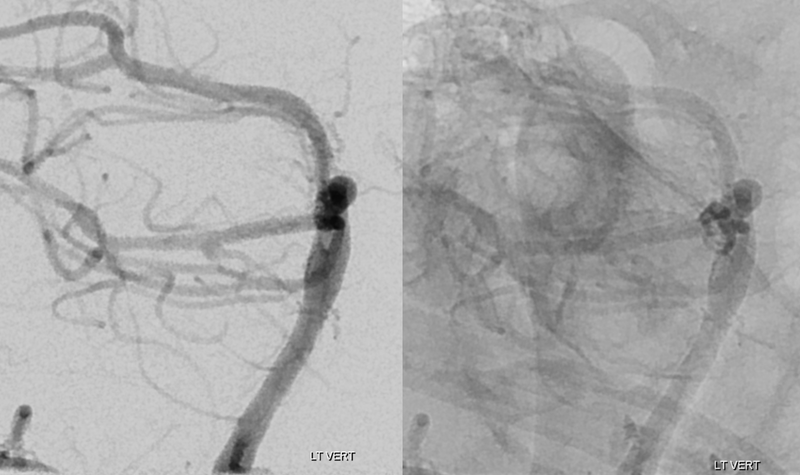 Usual endovascular choices — coil, stent-coil, Pipeline? How many Pipelines? 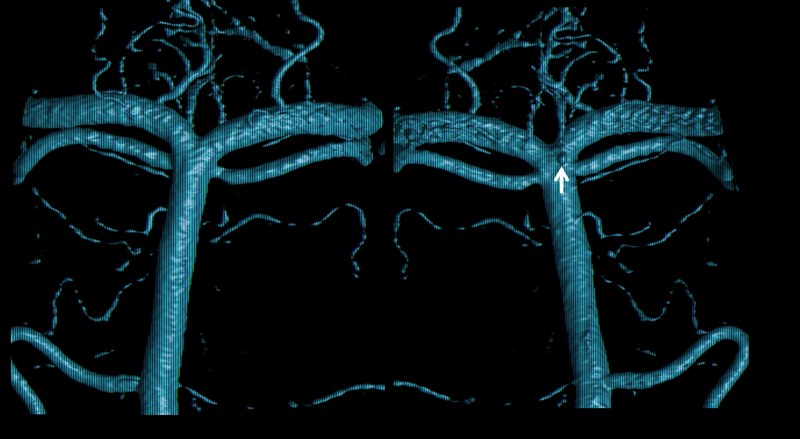 We settled on microsurgical clipping (right subtemporal approach) — why? Because this location is a different ballgame than a basilar tip. And we still have here with us some surgeons willing and able to do it. 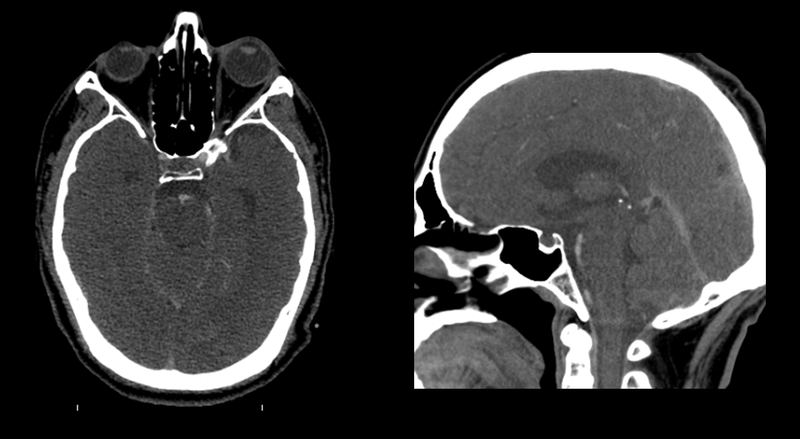 The result is a complete clip occlusion at price of partial right CN III palsy.